#1 – Four 12mm piezo discs that are glued to the bottom of the bridge plate, right under the saddle. This is very much like the K&K Pure Mini which uses three similar discs. The 4th disc bolsters the high E which is almost always weak when using only three discs. Together, this set of four discs picks up the desired string response with great string-to-string balance and a very natural sound. The soft attack and lack of quack are noteworthy. However, it also picks up a fair bit of the undesirable top plate resonances which results in low end muddiness and too much feedback susceptibility (boom). Remember, it is the main resonances that are going to start feeding back first—the two strongest ones are typically the low G# and then the F above on the D string. #2 – A single 20mm piezo disc that is glued to the far bass corner of the bridge plate. This disc is out of phase with the others because it has opposite polarity. 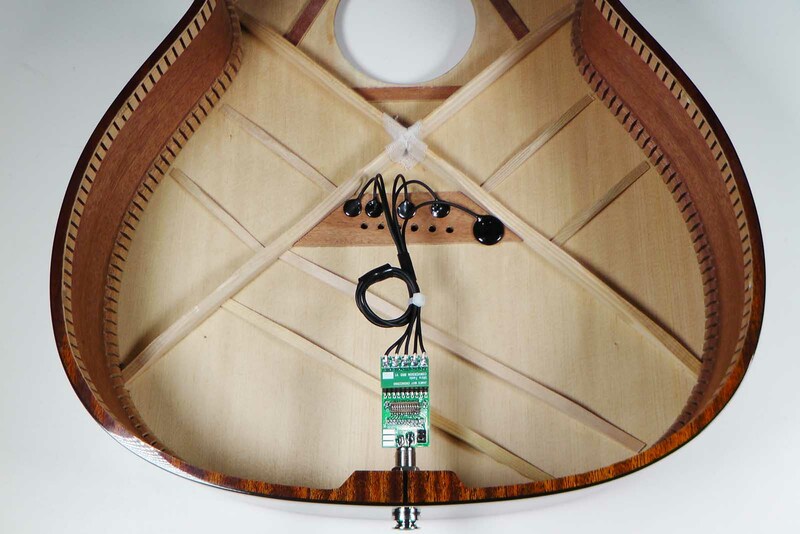 It picks up lots of the undesirable top plate resonances, and far less of the desirable string response. #3 – A balancing circuit board with integrated endpin jack that mounts internally to your guitar’s end block in the usual way. This circuit is passive. It contains a 12 position DIP switch that functions as a balance control. By selecting one of 12 possible switch positions, you determine how much of the feedback suppression disc gets mixed in with the main discs. What is unique to this patent pending design, and may not be intuitively obvious is this: If components #1 and #2 are blended together in a proportion such that their sensitivity to top plate resonances is about equal in strength, because they are opposite in polarity, the sum of the two will cancel out those undesirable resonances, leaving only the desirable string information. This is just what we want! 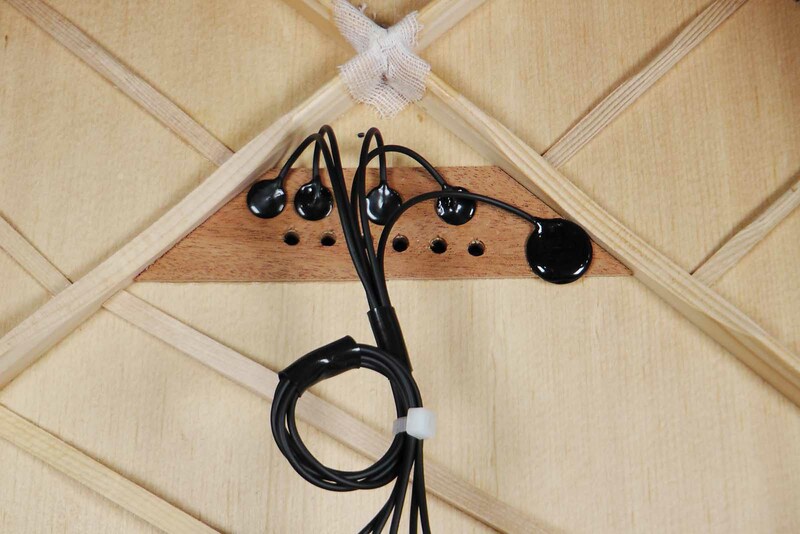 It solves all the problems associated with sound board transducers! The Ultra Tonic Pickup will typically be installed by your luthier or guitar tech. Self installation is possible for those that are are adept at pickup installation. Gel type super glue is highly recommended. The system may also work using double sided tape for mounting, such as 3M 254M, or carpet tape. If using tape, the signal level will be a tad lower, and the tonal balance and overall result may not be optimum. To complete the installation and properly balance the installation for best tone and feedback suppression, you must find the best switch setting. This can be done be ear, or more precisely by using a signal generator and an exciter. An AC voltmeter capable of reading single digit millivolts. A 200mV full scale works well, and most modern meters can do this. Fluke model 101 is such a meter. You will also need a cable adapter to go from ¼” male to two banana plugs or to test points to clip the meter leads onto. A calibration exciter, which is a kind of speaker without a cone. Its role is to vibrate the top of the guitar. This is available from James May Engineering. A signal generator capable of outputting a sine wave in the 90Hz to 130Hz range. You might want to use your smartphone as the signal generator. There are many smart phone apps that can do this. One such free app is “PA TONE”. Some smart phones like the Samsung Galaxy S6 (and others) have just enough output power to minimally drive the calibration exciter directly. If that is the case, you can avoid having to use an external amplifier. Otherwise, an external amplifier capable of driving an 8ohm speaker will be required. You can use a stereo or hi-fi amp, a guitar amp, a PA amplifier, or a headphone amplifier. For those that already have a K&K Pure Mini installed in your guitar, a conversion kit is offered that transforms a K&K Pure Mini into an Ultra Tonic Pickup. This conversion kit will not work for other brands of sound board transducers, nor will it work for the older K&K Pure Western with the larger discs. Upon special request, a version can be supplied with converts the older style K&K Pure Western. The kit consists of just components #2 and #3 as described above. It assumes your existing K&K Pure Mini will function as component #1, and that you are happy with your existing string-to-string balance. 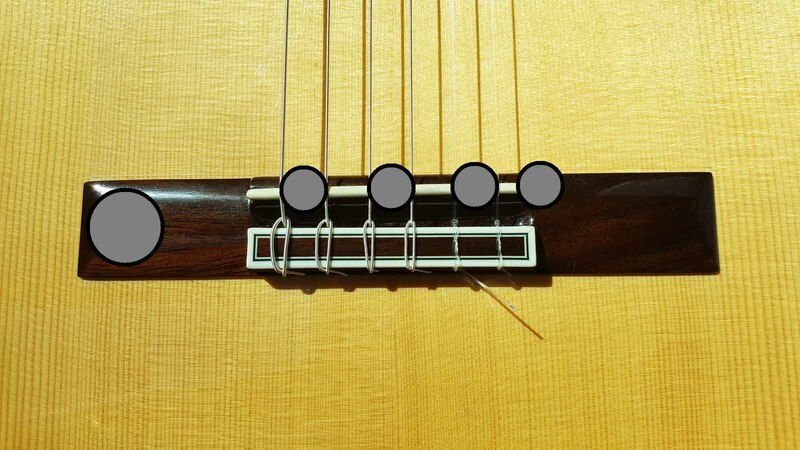 For nylon string guitars without a bridge plate, component #2 can be mounted in a functionally equivalent spot on the bottom of the top plate, right under the far bass side of the bridge. See pic below for the location of the discs drawn as grey circles above their bottom-side mounting locations.